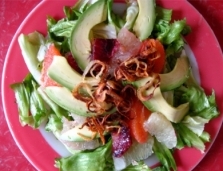 Any citrus will look beautiful with this salad, however the ones with the more assertive and tart flavors will be best. Avoid citrus that is too sweet with no balance of flavors. The dark color of the blood oranges contrasting with the escarole leaves is really striking. The sweet and tart flavors of seasonal citrus pair with the crunchy and bold personality of escarole and savory shallots. This is a satisfying and delicious salad to try in the winter months when these crops are in the peak of season. 3+ pieces of seasonal citrus sliced into “jewels”: 1 large Oro Blanco grapefruit, 1 blood oranges, 1 tangelo. Chop and wash one large head of escarole. 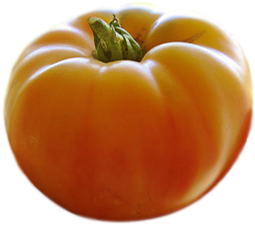 1” wide ribbons or tear into smaller leaves more appropriate for salad. Rinse and dry and set aside. 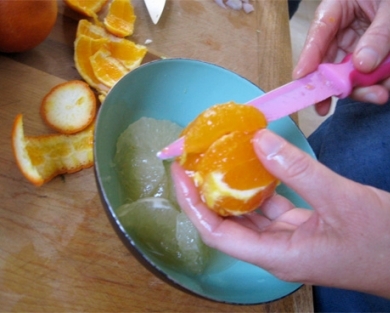 To make the citrus “jewels”, use a sharp knife to cut off the skin, first off the top and the bottom. Place the fruit on a cutting board, then proceed to remove the skin in strips starting at the pole and working your way down. Continue until all the peel and pith are removed and you have only the glistening citrus. Then, working carefully, slice the citrus into rounds, slicing crosswise. Place jewel rounds in a bowl, sprinkle with some salt and Set aside. In a small shallow skillet, pour 1/3 cup olive oil. Heat over med heat. Then add sliced shallots and fry til golden brown and crispy. Remove from oil and place on plate or paper towel. Space them out so they can crisp up.Reserve olive oil in the pan for dressing. Juice one tangerine and pour into a jar or measuring cup. Add the excess juice that has pooled in the bowl of citrus segments into the jar as well. This should give you about 1/3 cup of juice. 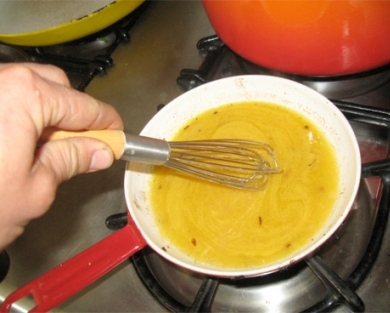 Add a 2 T dollop of Dijon Mustard. Add remaining olive oil from the shallot skillet. Whisk this up to emulsify then return to the hot shallot skillet and warm over a low flame til slightly bubbly, keep whisking to keep emulsified. Remove from heat and pour over escarole leaves and toss to coat evenly. 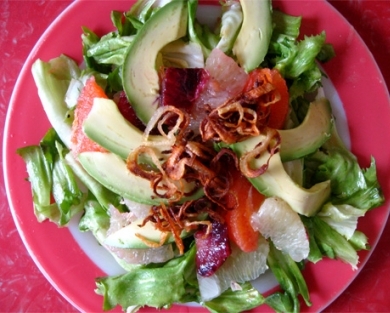 Decorate with the citrus jewels and slices of avocado. Sprinkle crispy shallots on top.